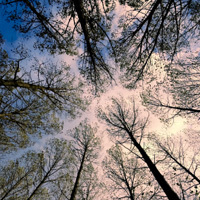 You are here: Home > Blog > Energy, sustainability & economics > What is Continuous Cover Forestry? One of the main objectives of many woodland owners is to grow trees for timber, but there are two main ways to do this. Either you grow a crop of even age and when these reach a certain age you cut them all down (“clear fell”) and restock the land, or you take out individual trees and maintain woodland cover permanently. This keeps much of the canopy closed and avoids the need to have a major visual hole in the landscape from a clear fell exercise. Continuous cover strategies have long been practised in continental Europe including in Switzerland, Germany and France. Indeed it is often the only practical way to manage woodland on steep slopes as a clear fell would lead to mudslides and washing away of the soil – having continuity of tree cover holds the soil in place. Since the great conifer plantings of the 1920s and 1950s, the Forestry Commission and their grant structure has heavily promoted even-age trees crops with very few tree species. Recently this approach has been challenged - so much so that the Forestry Commission is now encouraging continuous cover but only in a limited way. There is an information and lobby group called the Continuous Cover Forestry Group that was set up in 1991 and who hold informative events. Their website is at www.ccfg.co.uk. They are keen that forest should be seen as much more than just the trees they produce - management should promote the whole forest ecosystem “including the soil, the forest micro-climate, asociated fungi, flora and fauna as well as the trees themselves.” What they argue is that a respect for the ecosystem will lead to a presumption in favour of continuous cover and natural regeneration. Natural regeneration will mean allowing woodland gaps to be filled, where possible, by trees that are self-sown. One advantage of such an approach is that the landscape is not dramatically changed every 30 years by clear felling with its associated problems – damage to soil, allowing wind to get in and cause wind-throw in neighbouring woodlands and habitat change that some wildlife may find impossible to survive. The drawbacks are that continuous cover can be more expensive to organise with more management time needed and the requirement for regular visits from contractors. It is also associated with a wider variety of trees species and this may make harvesting trees a more involved and less economic activity. how to convince the forestry establishment and the authorities that the costs and effort in doing this are worthwhile. Most of the individuals who buy small woodlands are naturally inclined towards continuous cover and natural regeneration and presumably the current shift in woodland ownership from passive investor to small woodland enthusiast can only be good for the continuous cover movement. Continuously covering our forest means that we should plant in more trees to cover up those bald spots that were caused by all of us. ALl those wasted papers and all those trees that were cut down should be replaced for us to be able to continue living in this earth. We don’t want mother nature to be angry at us, do we? I am optimistic that the forestry owners will work in networks in the future – even so forestry coverage has to be large enough in an area to make this work. In the meantime Clear fell has to be the only option as “hobby” forestry is not sustainable long term on finacial grounds. PS – I place myself in the “hobby” category – as I have not made a penny from the wood financially – but do get fantastic reward through working in my wood.